Griff is an agility dog and was referred due to a breakdown of muscle from extreme physical exertion. Griff has completed a course of 10 sessions and now back fighting fit and doing what he loves most… if he behaves himself in the ring. 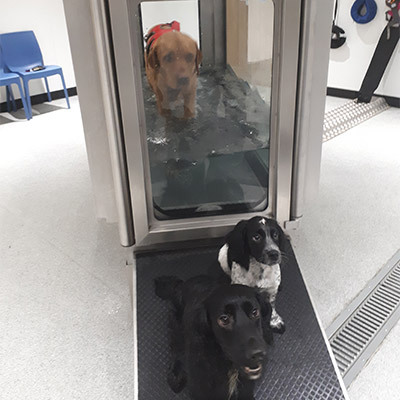 The lovely Dexter has been attending hydrotherapy for weekly sessions to improve his muscle mass and gait quality post cruciate repair. Its been a pleasure treating Dexter, meeting all his family and glad he’s back to his happy little self and enjoying running around with his friend Dillon. Referred for luxating patella. 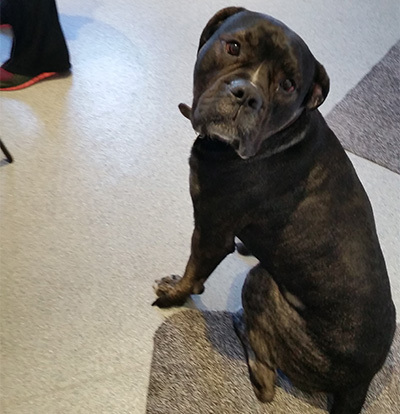 Mac attended weekly and after just 5 sessions has shown great improvement and strength. He is now back off the lead and loving his walks. Mack and Dodge compete at Flyball and travel the country in competitions. Sure little Bandit will follow in their footsteps soon. There attend hydrotherapy for fitness to maintain strength and build on their cardio. Joey AKA my little velvet fox was referred for hydro due to a luxating patella and muscle loss. He copes extremely well in his sessions and has been attending weekly to build up his muscle to support his little patella (knee). Charlie was diagnosed with bilateral hip dysplasia and at a young age was restricted to lead walks and pain killers. Charlie has been attending weekly and increased in muscle mass to support his hips; he’s now off the lead and currently on no medication. 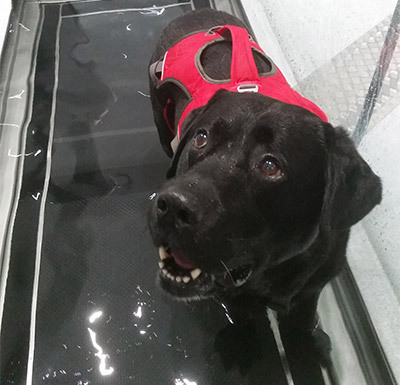 Angus was referred to help improve muscle and strength to support his forelimbs. He attended weekly for a course of 12 sessions and loved his time in the treadmill plus receiving his Duck and Cranberry treats. We introduced the incline to transfer weight and he gained a good build up in muscle mass in his hinds too to also support his forelimbs. 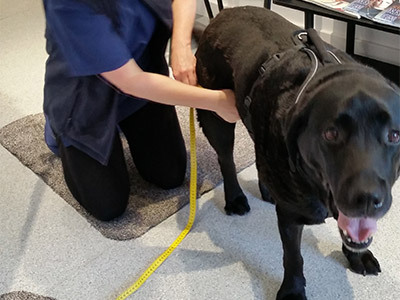 Ruby was referred for hydrotherapy via their Veterinary Practice and recommended twice a week for 5 weeks. 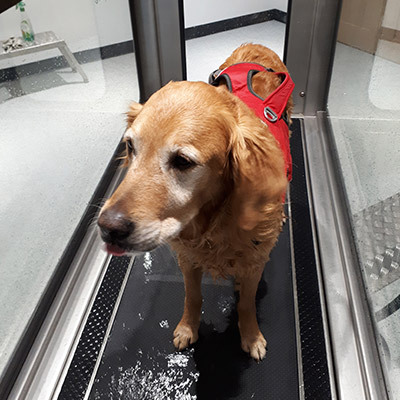 Ruby was suffering from Bi Lateral Luxating Patella and attended hydrotherapy to strengthen her hinds to support the stifles with the aim to avoid surgery. Ruby has completely all sessions, gained muscle mass and no reported issues. Good luck Ruby. 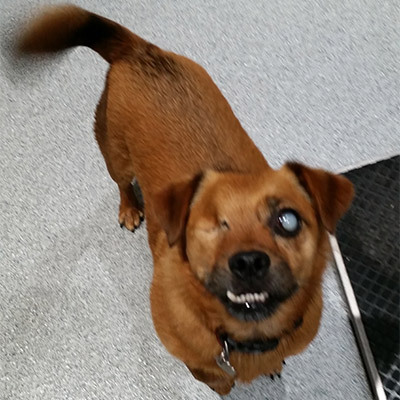 Pixie was referred after being diagnosed with hip dysplasia at such a young age. Pixie attended weekly then reduced to monthly due to improvements in her hips. Pixie has now completed her course of 10 sessions and we wish her all the very best. 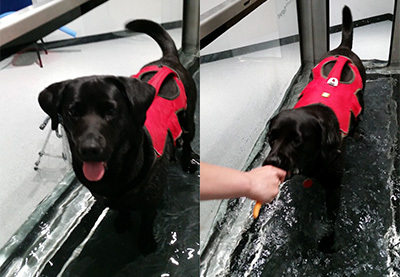 Border Collie Jasper has been enjoying his hydrotherapy fitness sessions helping to improve his cardio and stamina. Sharon, Jasper's devoted owner, travels the country entering him in competitions. 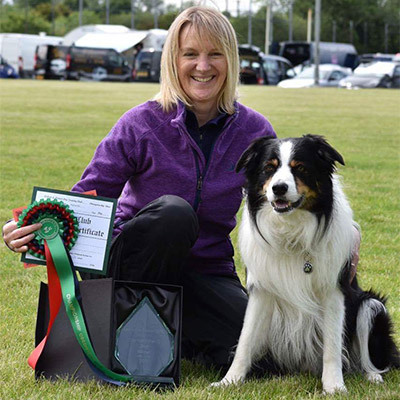 In June 2017 Jasper won his third Challenge Certificate in Obedience at the prestigious Crufts competition in Ireland making Jasper an Obedience Champion, the only one in Cumbria. Bilateral TTO (Triple Tibial Osteotomy) surgeries for CCL (Cranial Cruciate Legiment) disease and arthritis in his left fore. 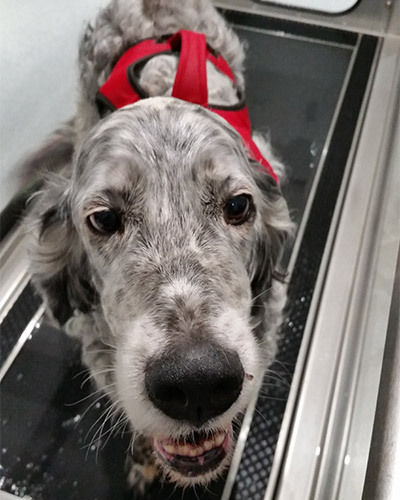 It’s always a pleasure having Max and his family in for his weekly hydrotherapy sessions. Max has had surgery on his stifles in 2014 with the other in 2015 and since attending Northwesthydro he has gained now a total of 4cm of muscle mass in his hinds. Post surgery Max has become low in his hocks and were starting to see the strength come back in his hinds and will be working on improving his gait. Max is also on a controlled diet and to date has lost 3kg with hopefully more to follow. 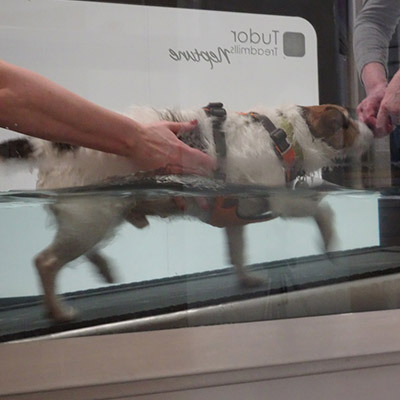 The aquatic treadmill is a great form of controlled exercise for Darcy’s condition as we can control the water level to avoid any hydrostatic pressure around his chest. 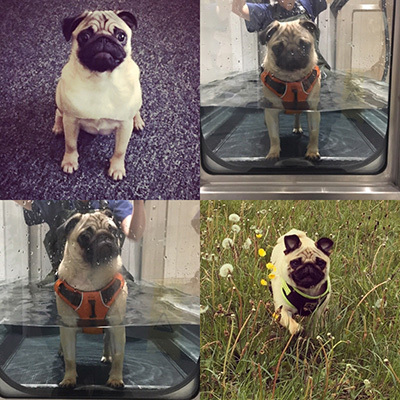 Darcy has been attending hydrotherapy on a fortnightly basis, such a great little character he has gained 2cm of muscle mass in both hinds. Well done. Beau was referred to help with lameness and being slightly overweight which is added pressure on her joints. She has been attending weekly and loving her sessions as she does receive a few carrot sticks for treats. We have seen a great improvement in her range of motion, has increased muscle mass and is no longer lame after her walks and swims in the river. She has also lost 6kg in weight. Pleasure working with Beau and her family. 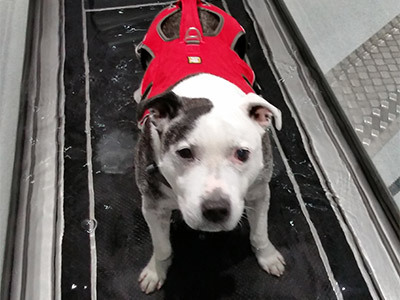 Patch has been attending Hydrotherapy weekly to help gain strength in his hinds as he suffers from arthritis. Hydrotherapy has helped build up strength in his limbs and reduced dragging his feet which was scuffing his nails. He has shown great improvement in his fitness levels and has bursts of energy on his walks. Merlot suffers from lumbosacral disease and lameness in his left hind. He has been attending weekly for a course of 10 sessions and now comes fortnightly. Merlot has now regained muscle mass in his hinds and especially has improved his mood swings and behaviour. Pleasure having him and his owners in for hydrotherapy. 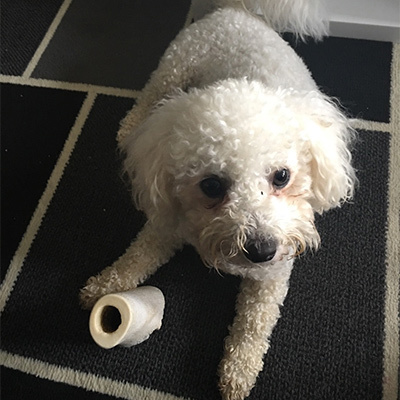 Louie was diagnosed with osteoarthritis in January 2015 at such a young age. 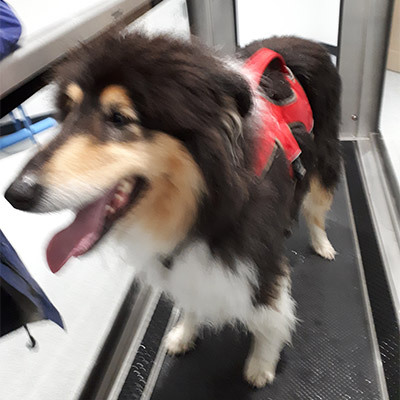 When he arrived to hydrotherapy he has severe muscle atrophy in his right hind, minimal weight bare and was unstable in the treadmill requiring maximum support. He does enjoy his regular walks but would be stiff and lame afterwards. 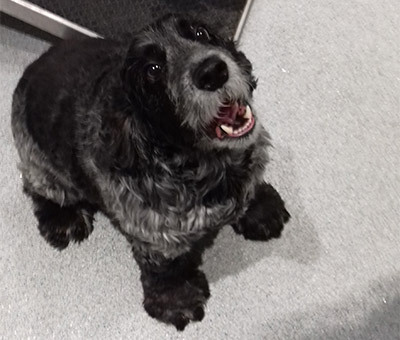 Louie has completed a course of 10 sessions and now attends monthly to maintain muscle development and strength, plus he just loves his sessions. 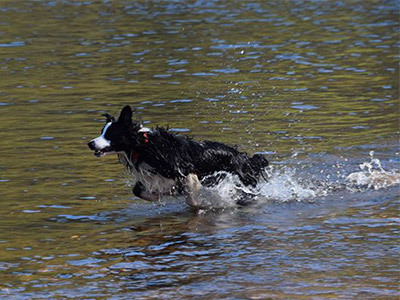 He has transformed into a lively young Collie, jumping for his Frisbee and swimming in the rivers. His muscle mass has increased by a staggering 2.5cm in his right hind. 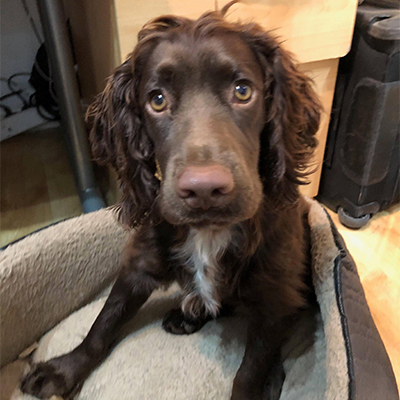 When he attended hydrotherapy at 18 months old, Monty had spent a lot of time on bed rest and on short lead walks due surgery of a wedge ostectomy and trochlear block recession to treat medial patellar luxation in his left stifle. He was referred to help build up muscle which he lost pre and post op and to help improve his gait pattern which was of a valgus position. As the weeks have gone by, Monty has gone from strength to strength, enjoying his sessions and re gaining good range of movement. He’s been a pleasure to work with and his muscle increase has been fantastic taking him from 36cm in his left hind to 41cm. 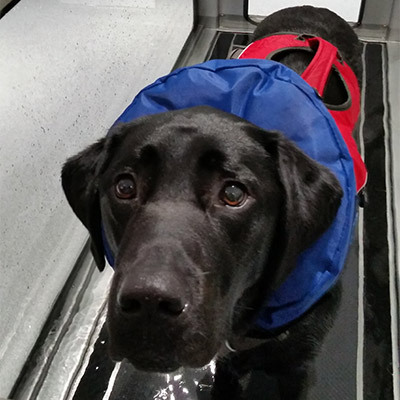 Monty continues at hydrotherapy and he’s back to being the mischievous puppy and loving his walks now off a lead. 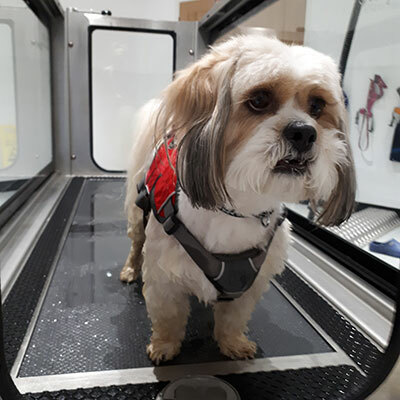 Lovely gently Oscar has been attending hydrotherapy on a weekly basis to help keep a good range of movement in his stifles after surgery for bilateral cranial cruciate rupture via TTO (Triple Tibial Osteotomy). He also has severe arthritis in his stifles and has hip dysplasia. Since attending hydro Oscar has gained a total 6 cm in muscle mass in his hinds. He enjoys his sessions and loves his treats of carrot sticks afterwards.